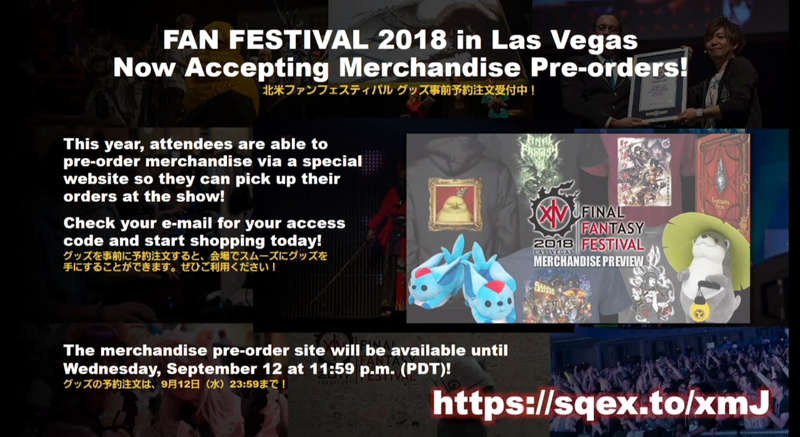 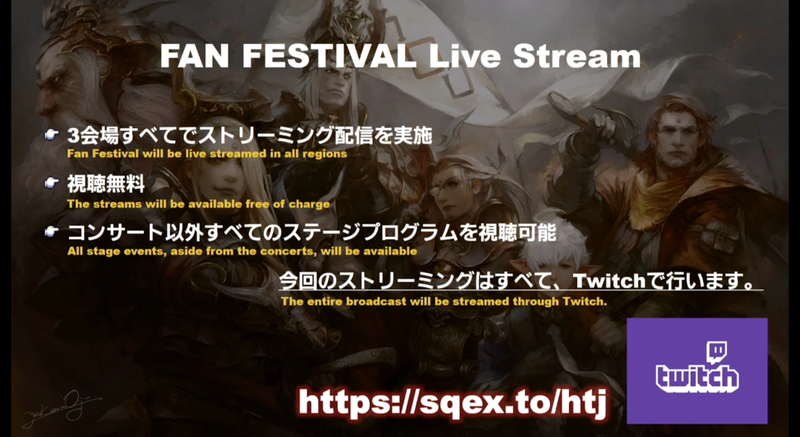 Soken and sound team were in development hell so the trailer could not be finished in time for the stream. 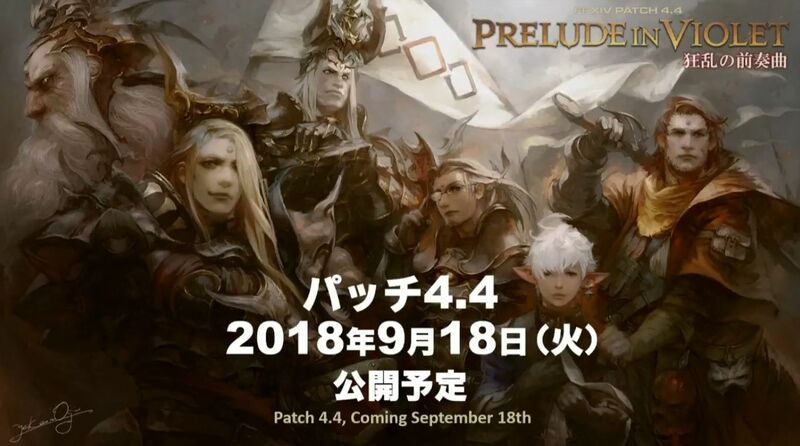 It’ll be released this/next week. 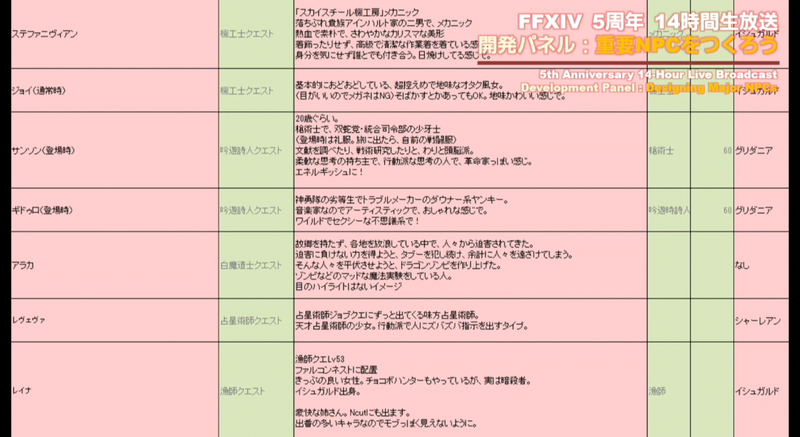 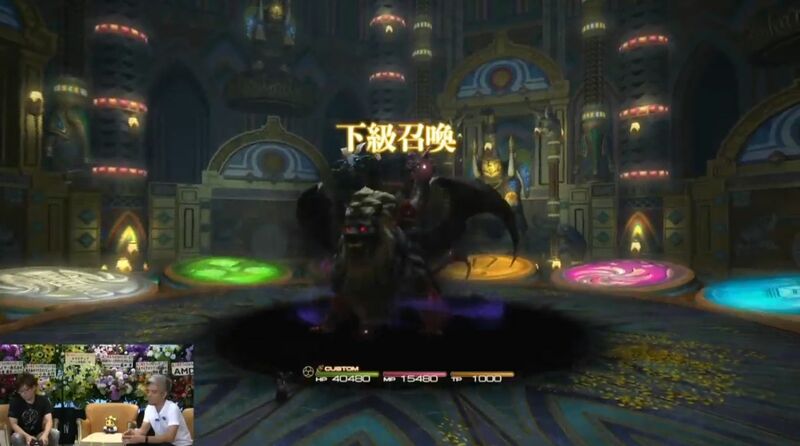 RDM buffs to both ST and AoE. 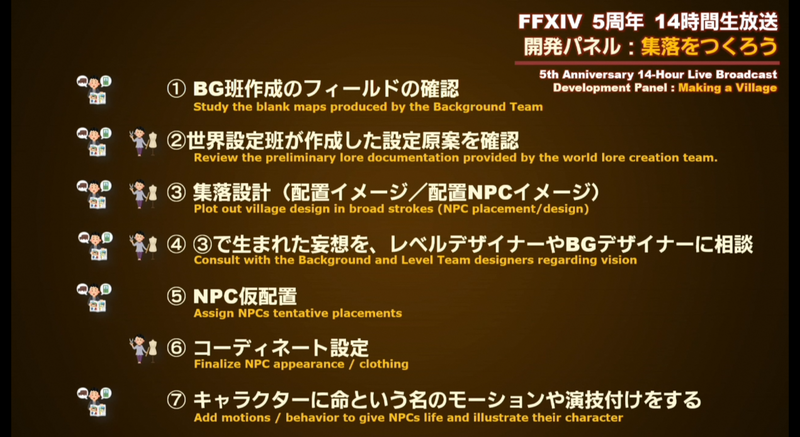 The job hasn’t been touched since SB launch, but comparing it to SMN, even with the raise utility they felt it was too far behind. 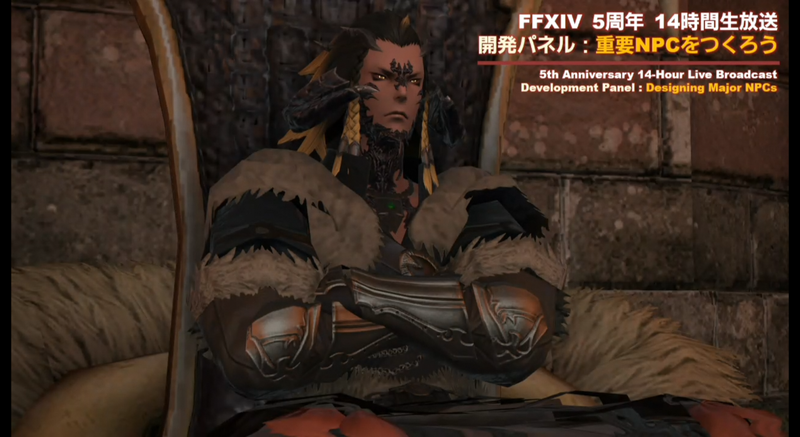 Ground effects and Passage of Arms will take effect immediately instead of waiting on the animation. 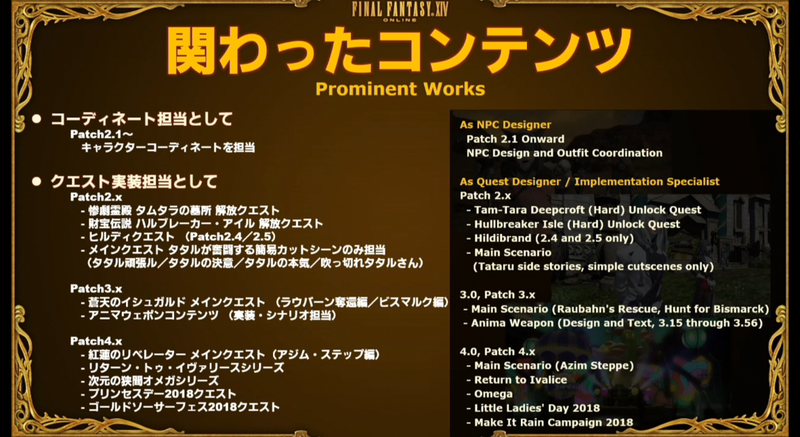 QoL improvements to various jobs. 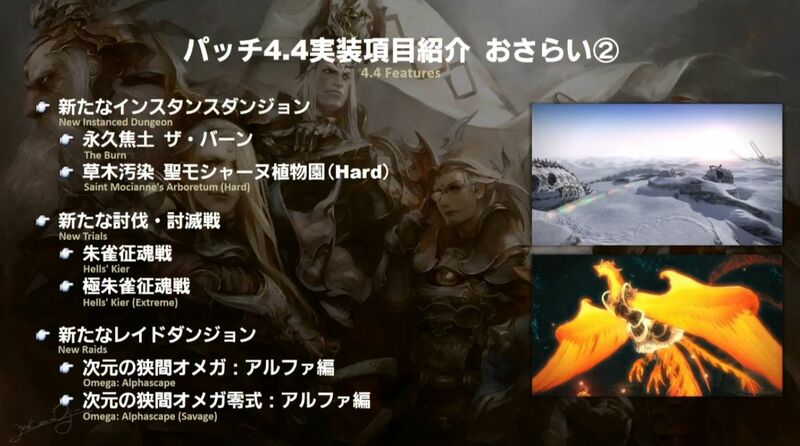 The new Eureka map is called Pyros. 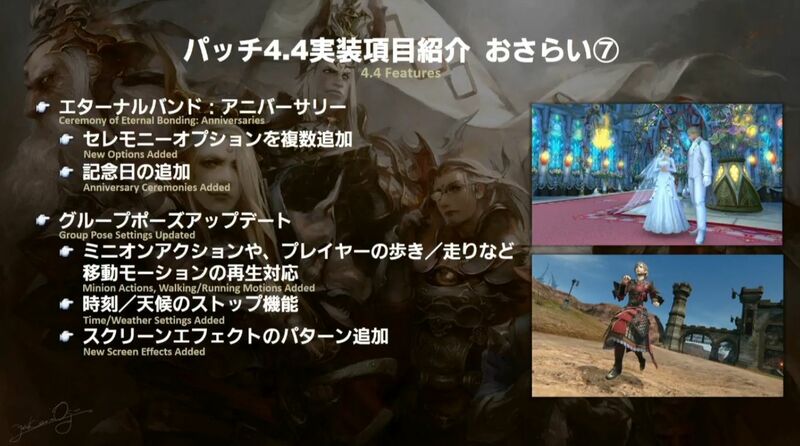 The Pyros weapons will be able to go past maximum substats, within Eureka only. 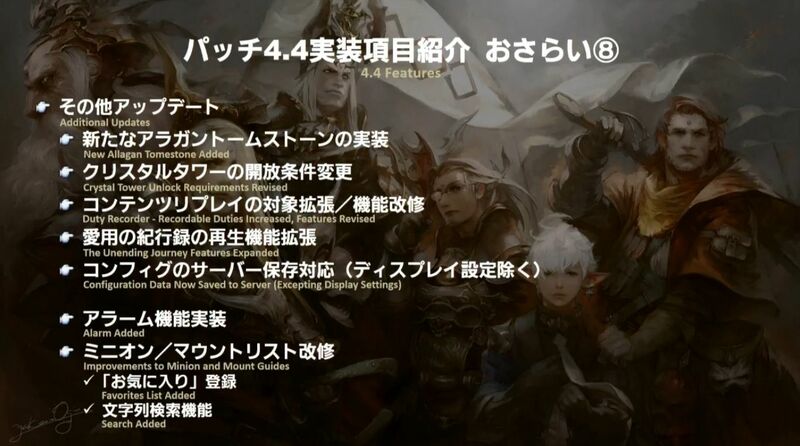 For the server-saved config data, since they’re really afraid of corrupting your 5 years of settings, they’re being very careful with QA/debugging and there will also be a backup saved client-side. 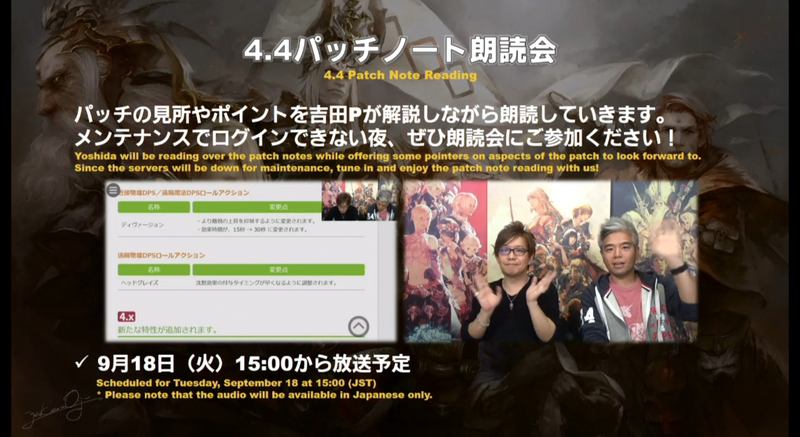 The feature will come to PC first and PS4 later. 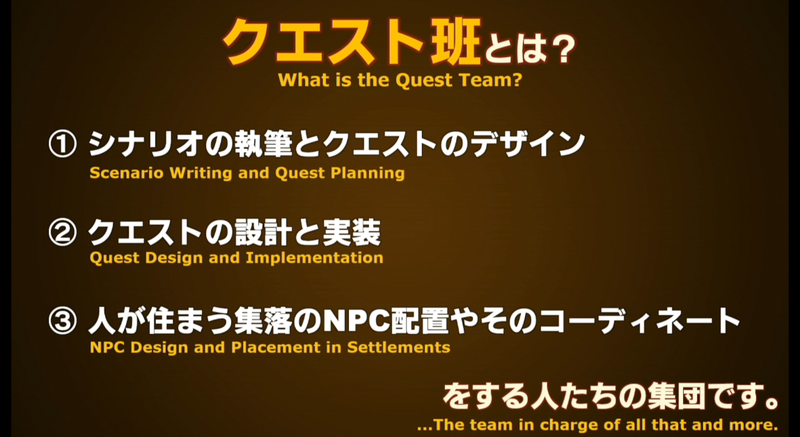 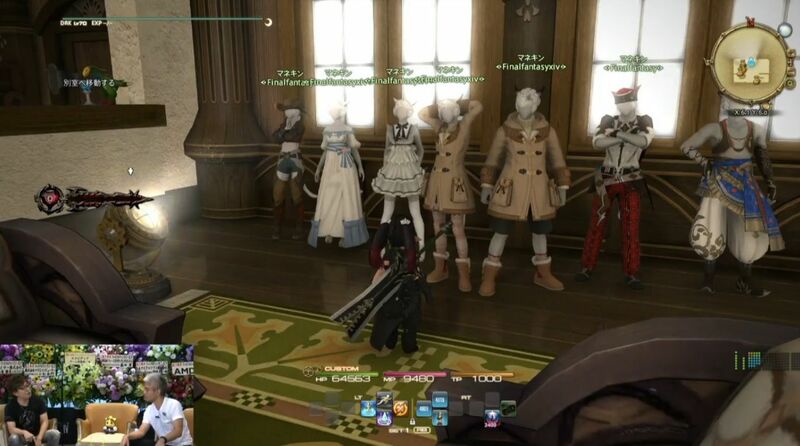 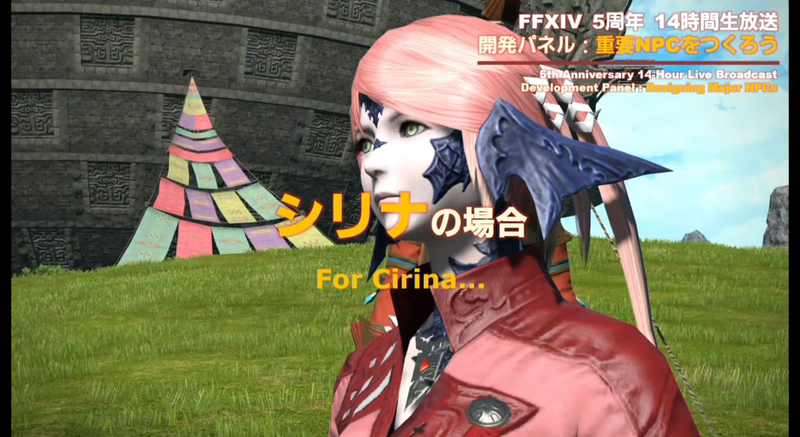 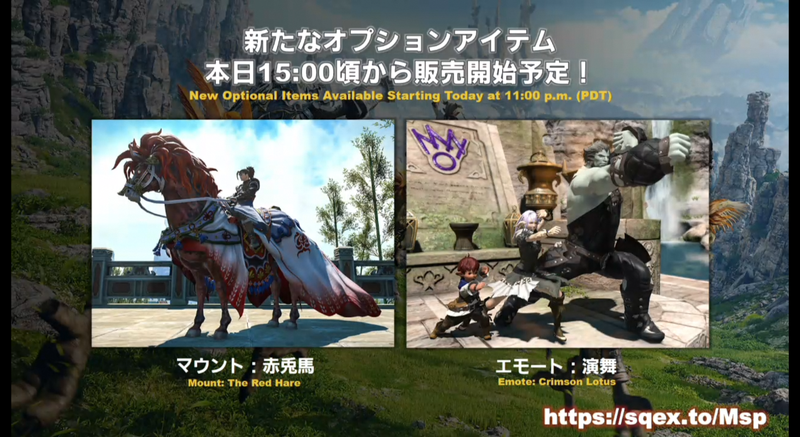 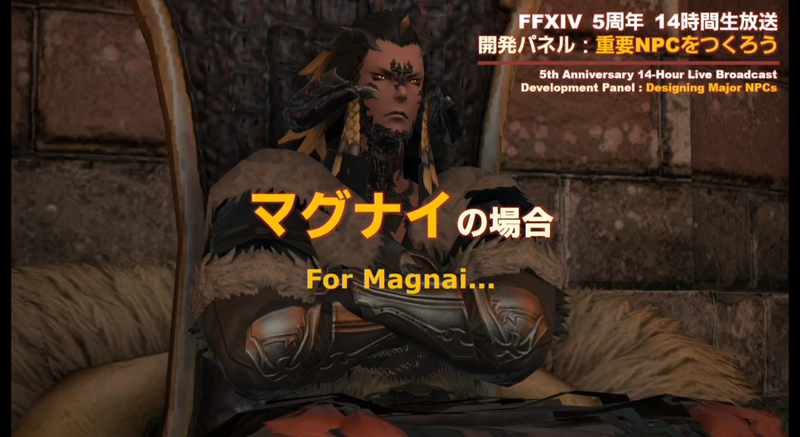 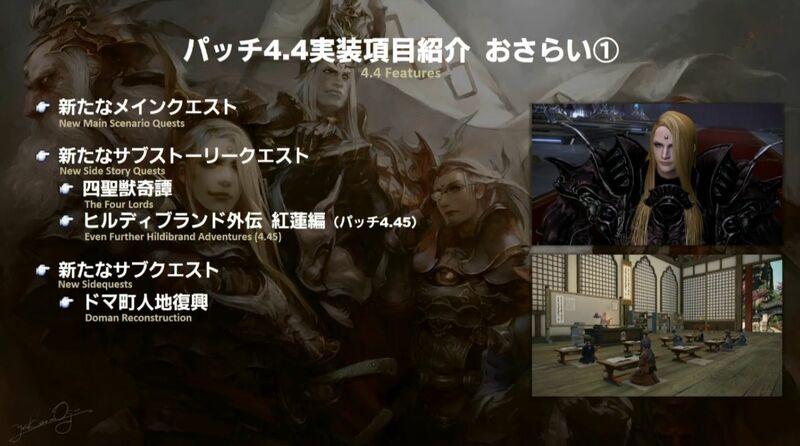 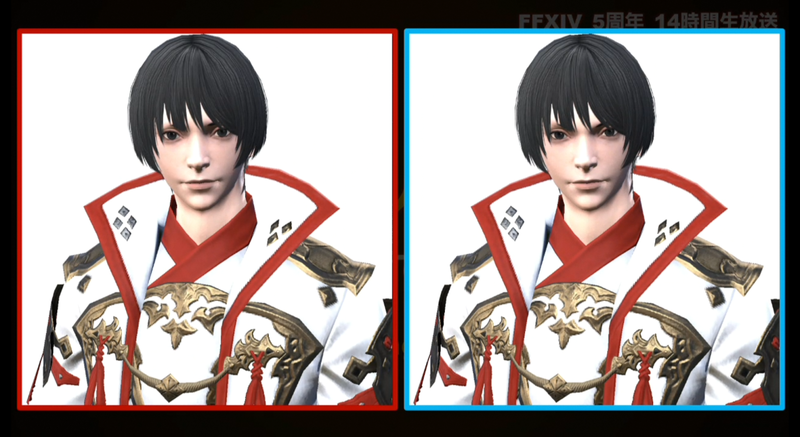 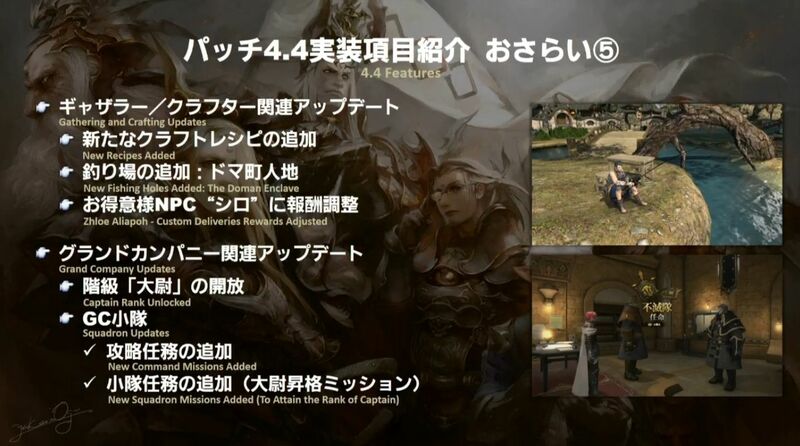 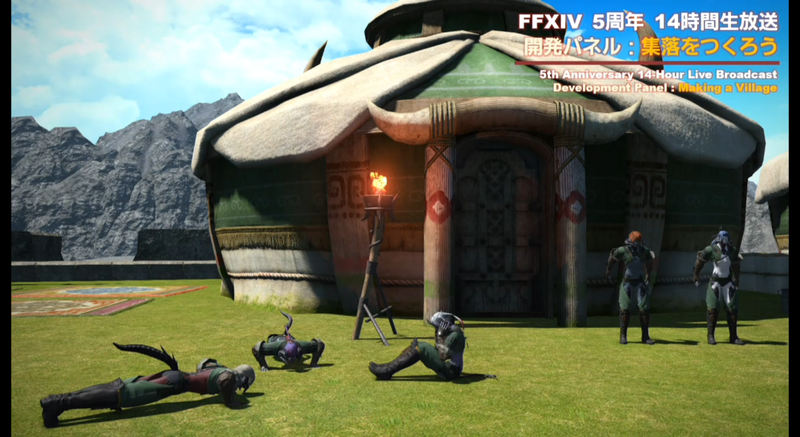 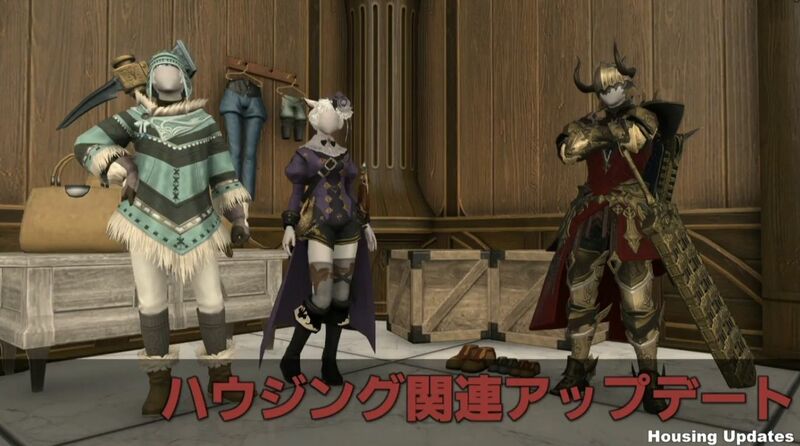 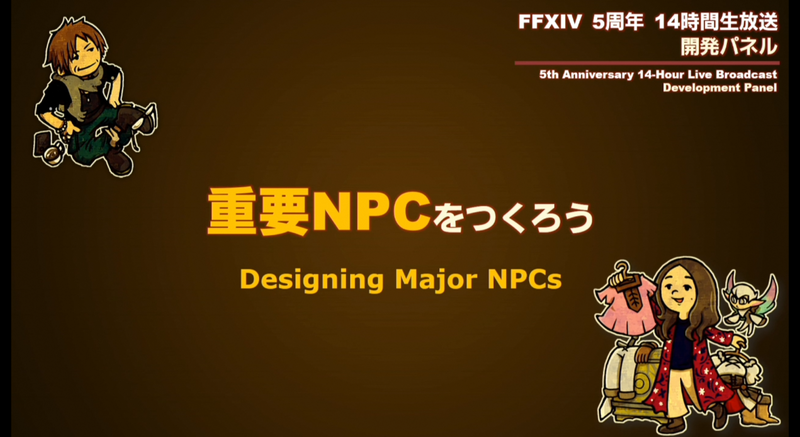 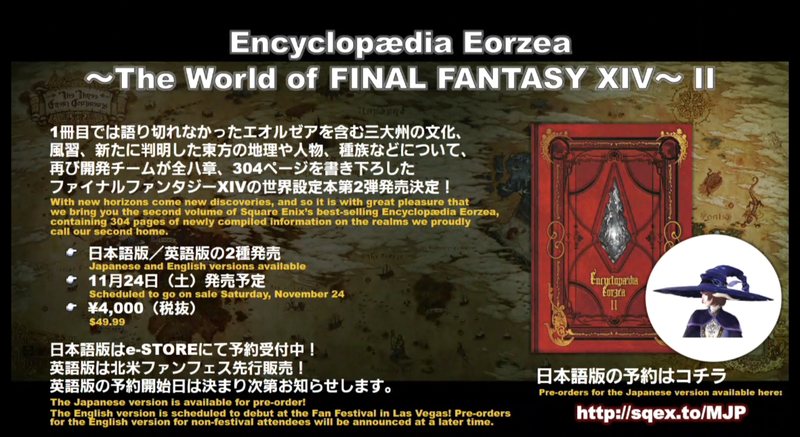 The alarm feature will work for Eorzea and local time. 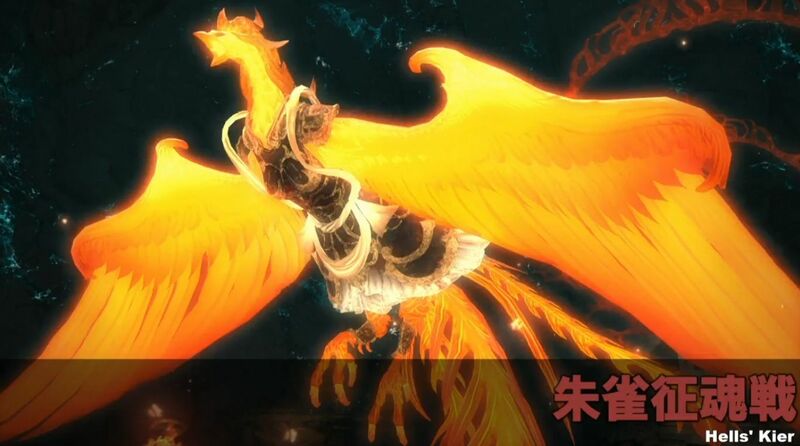 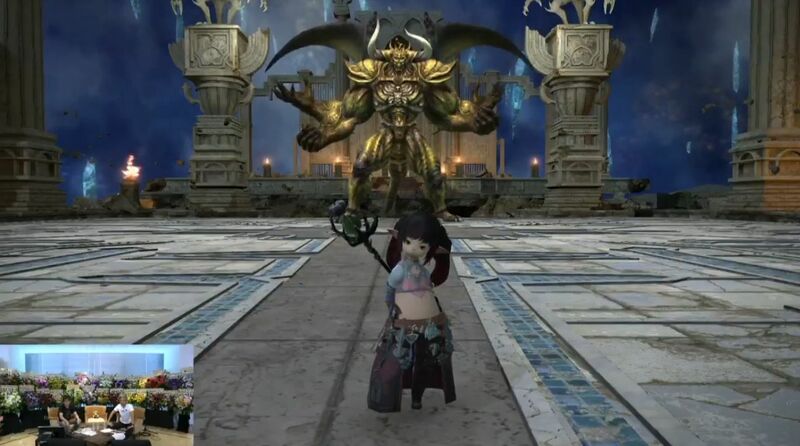 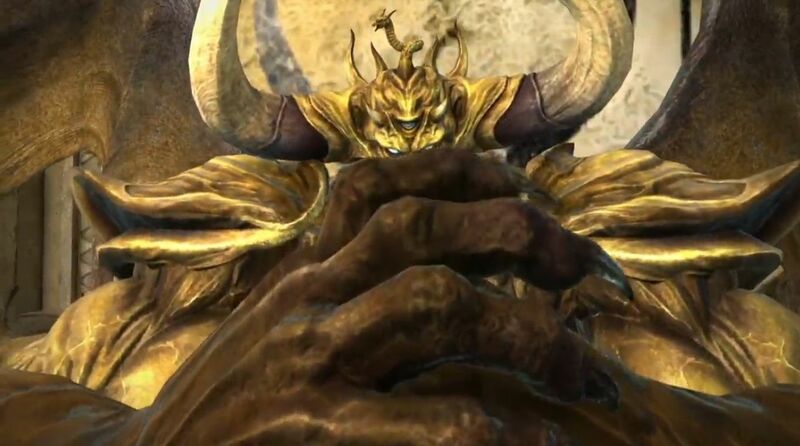 The next foe to be created by Omega is Chaos from FF1. 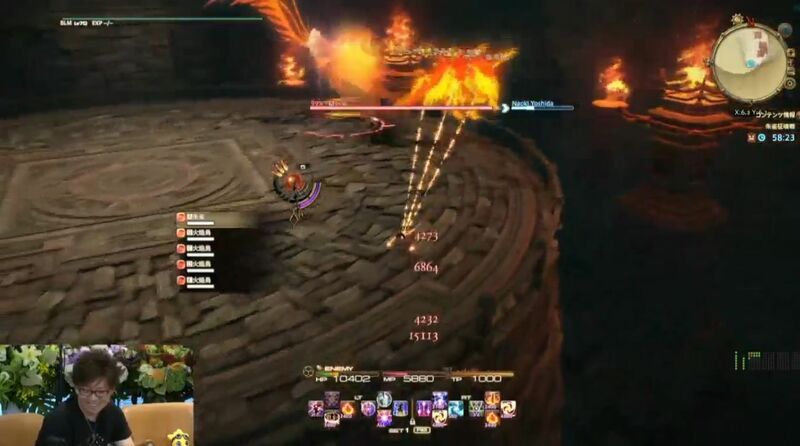 You can fall off the arena. 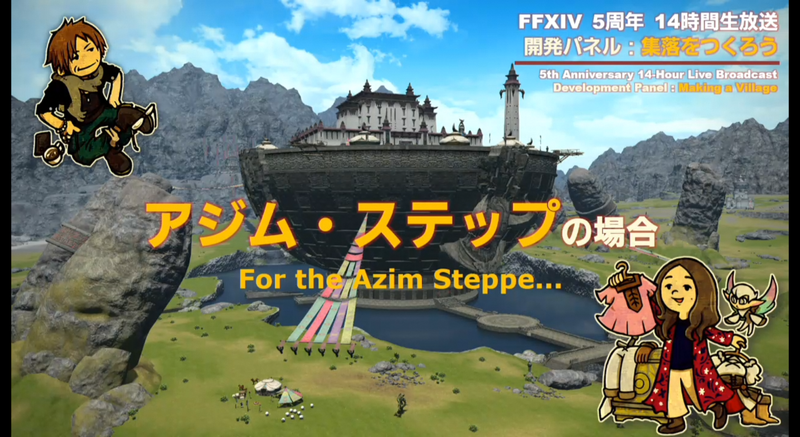 Alphascape will be very story-intensive since it’s the finale. 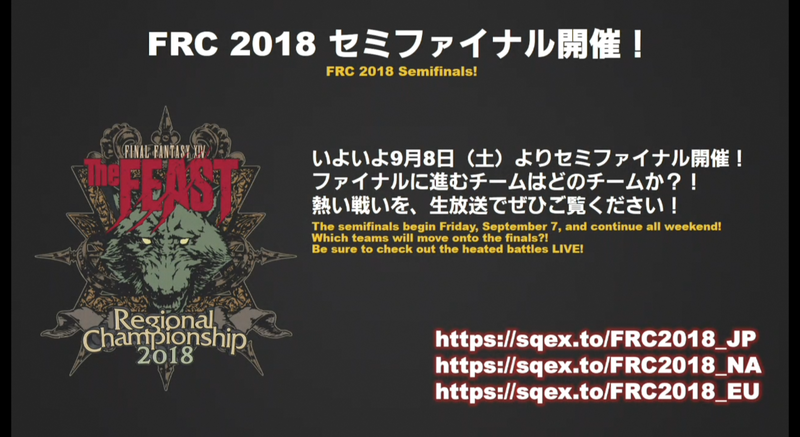 They didn’t show the rest of the fights to avoid spoilers. 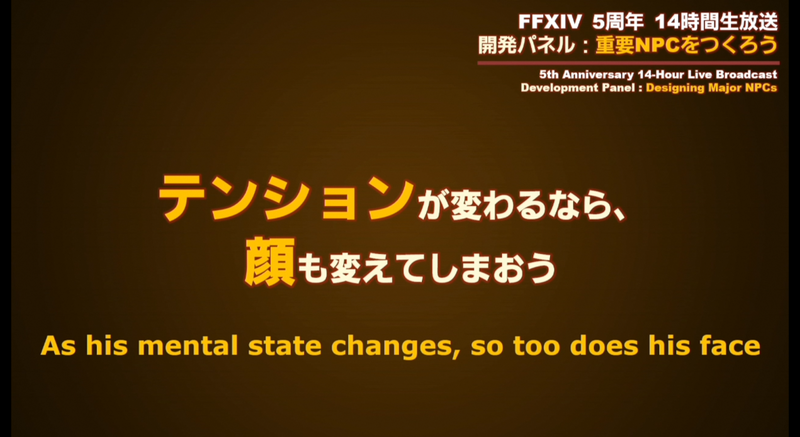 The music for the first half is the same as Byakko, but the second half is new and sung by Yoshino Nanjou. 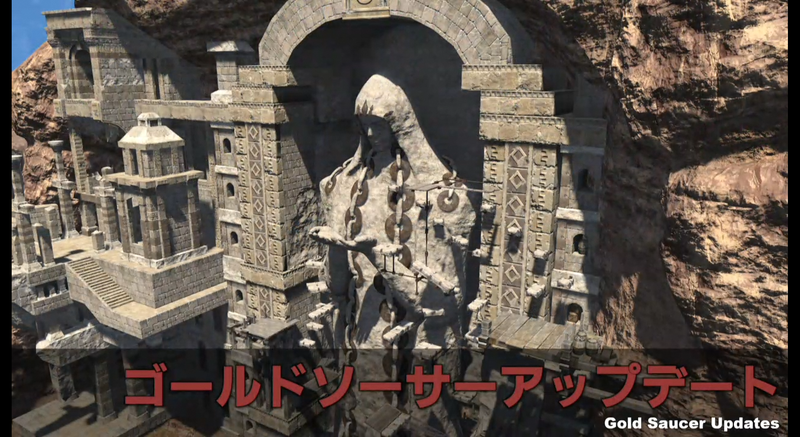 Expansion to Lost Canals of Uznair. 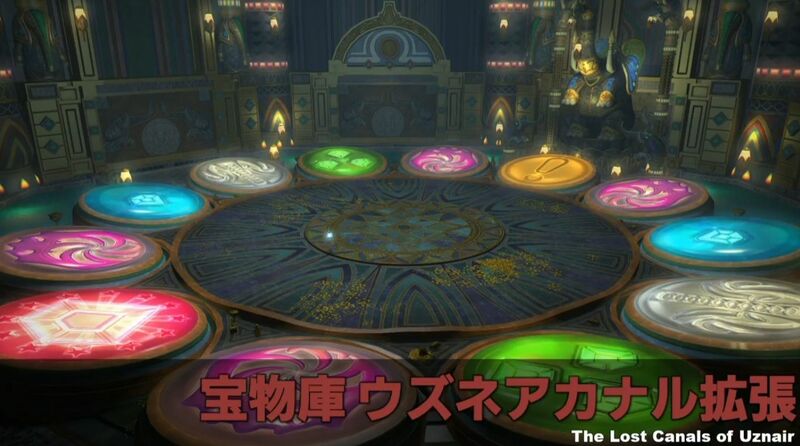 This time it uses a roulette wheel. 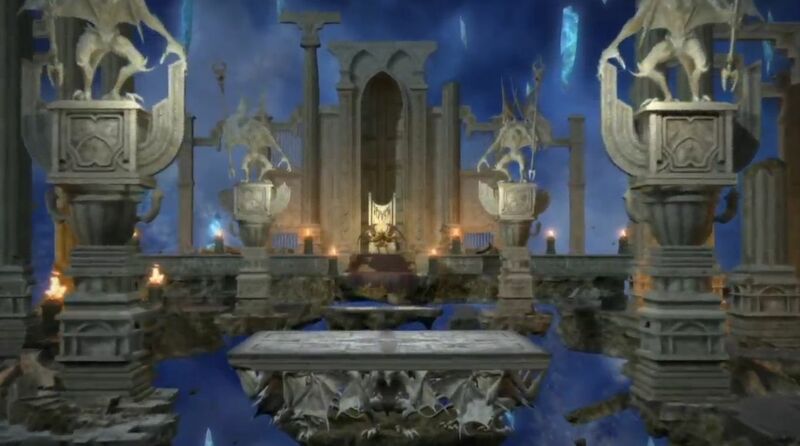 The setup is like a boss gauntlet. 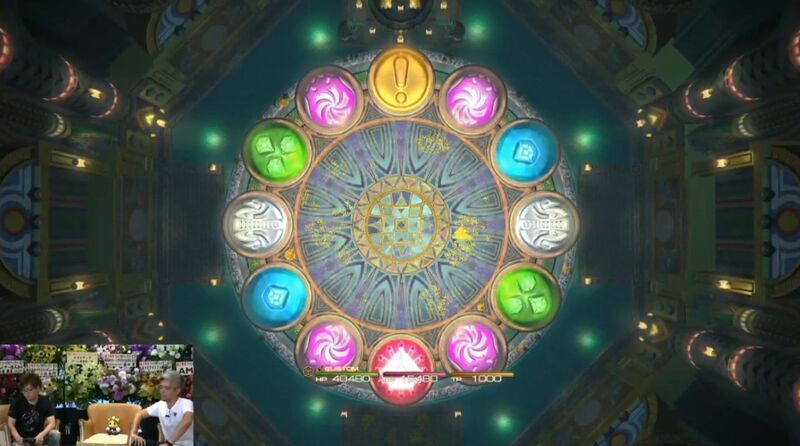 Landing on a diamond tile spawns a boss, after defeating it the chest spawns, and it automatically moves to the next round after you open the chest. 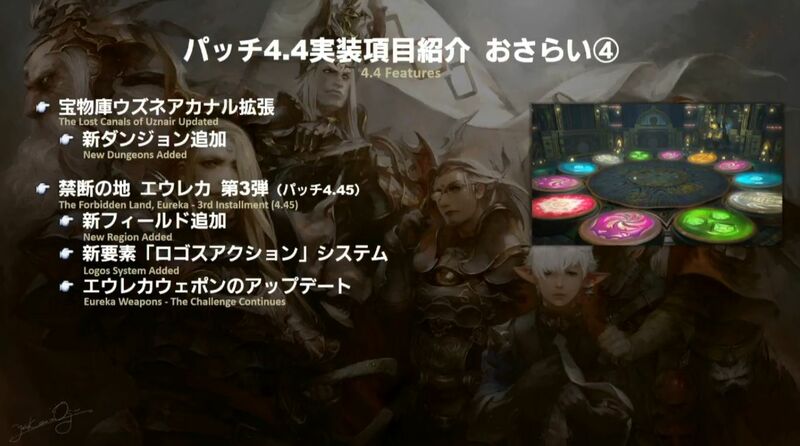 Highest is 5 rounds. 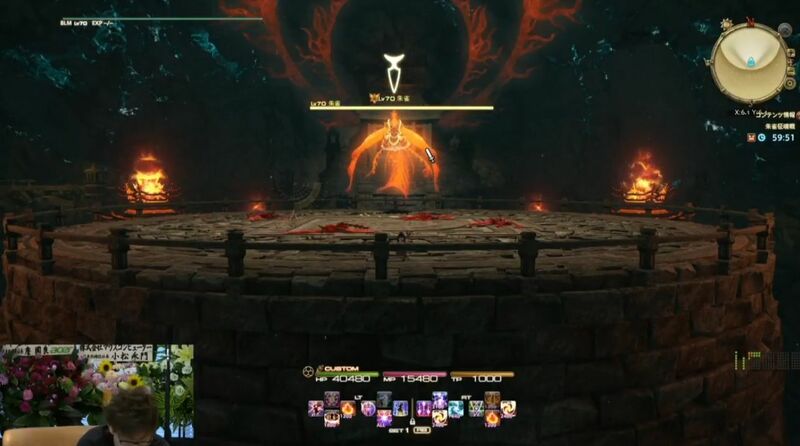 More Atomos tiles appear as you make it further in. 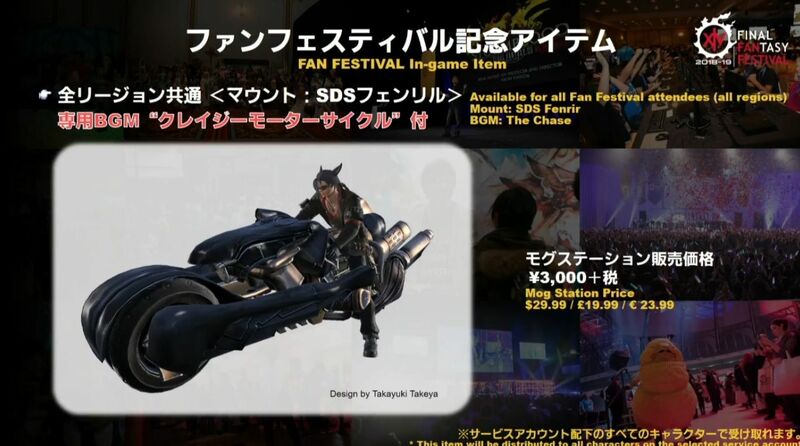 The SDS Fenrir mount can jump and fly. 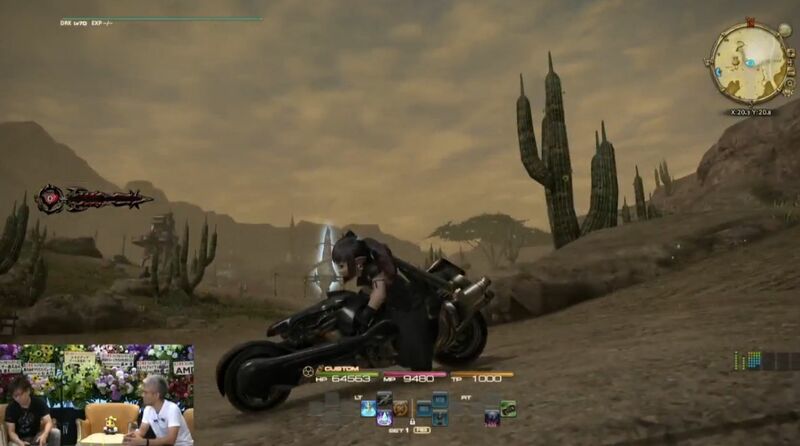 BGM is of course FF7 “Crazy Motorcycle Chase”. 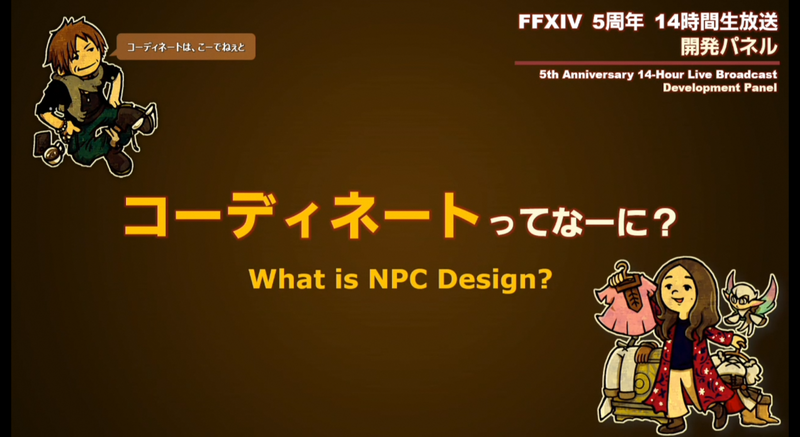 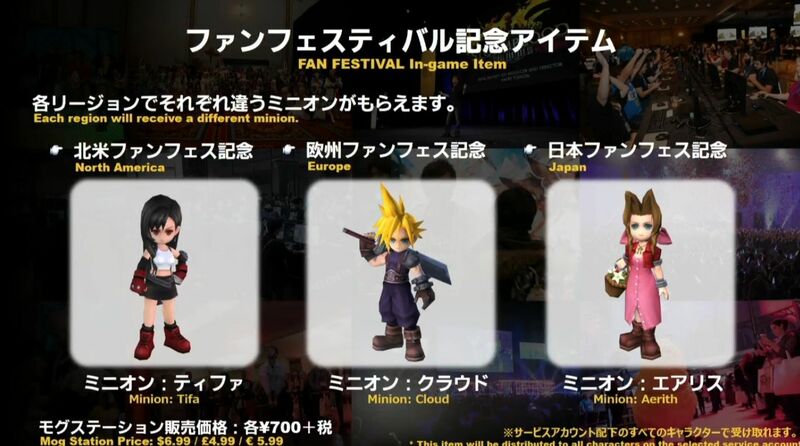 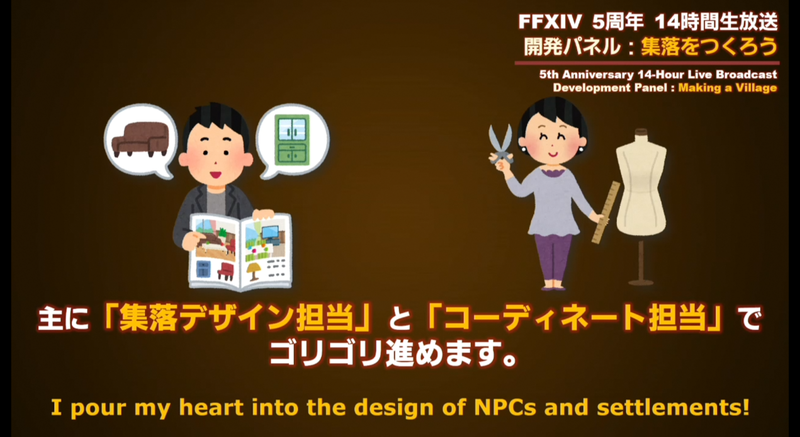 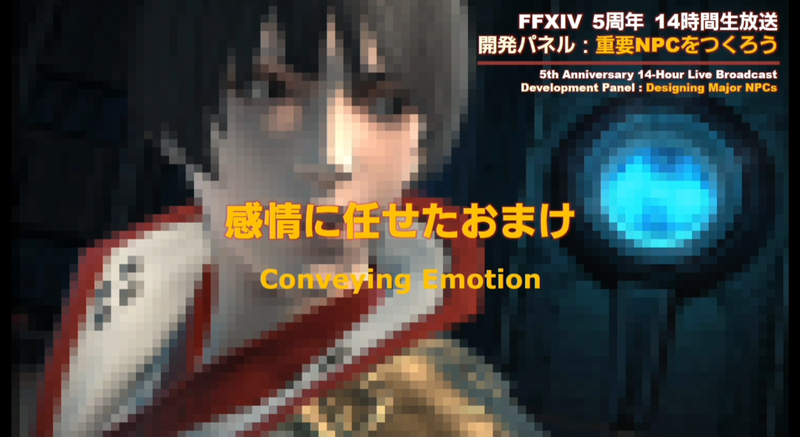 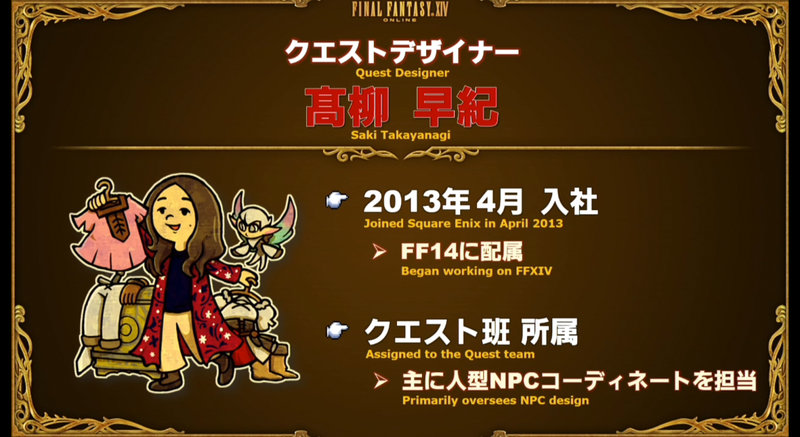 Minions have special animations and received special direction from Tetsuya Nomura. 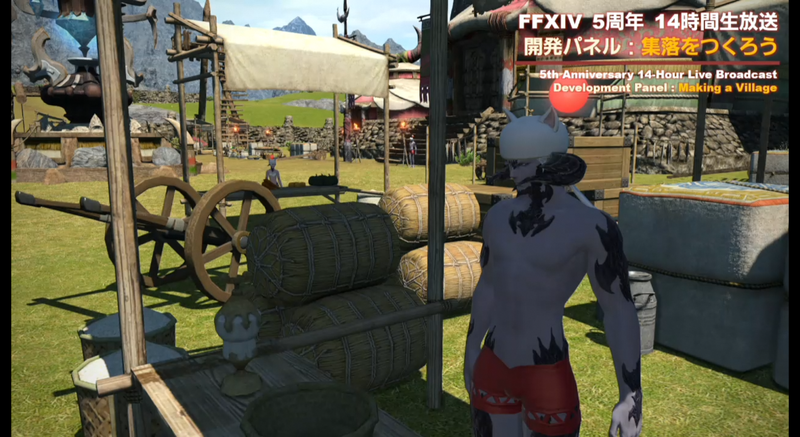 You can allow players to purchase the gear on the mannequin (doesn’t affect appearance, but does affect stock). 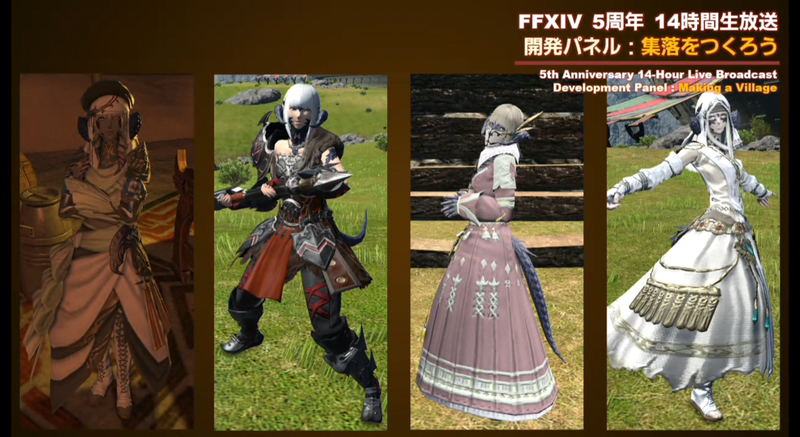 Gear can be either sold individually or as an entire set. 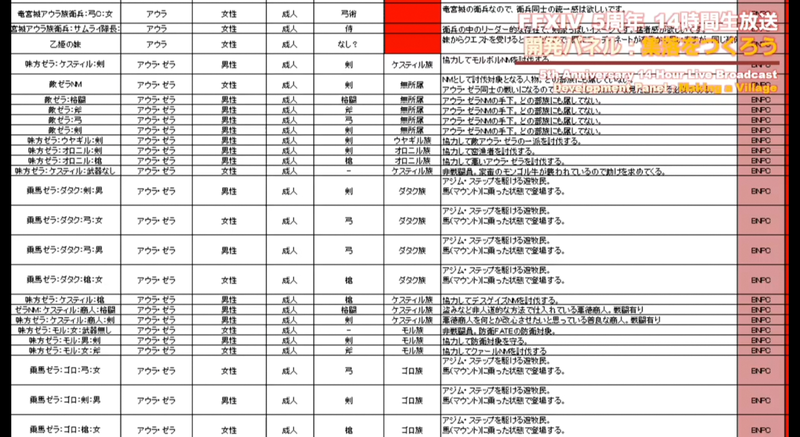 If it’s listed as a set, then the market board listing will show which house it’s being displayed in. 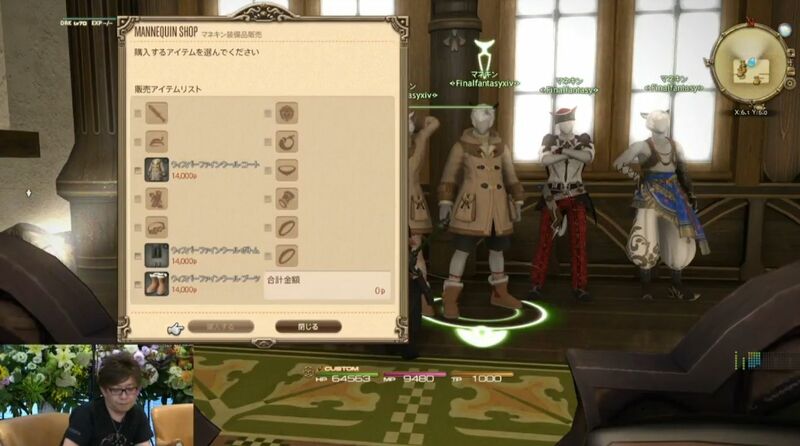 When you place a mannequin, you have to select the retainer that will manage the sales. 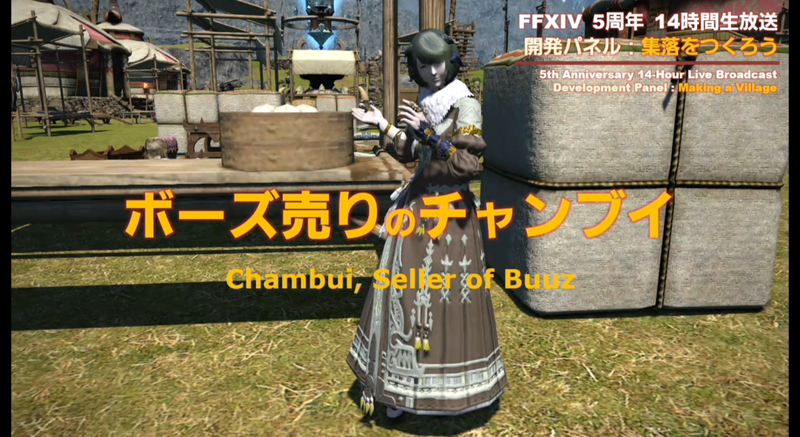 You can also choose display-only mode, but the UI is not ready yet so it still uses the sell UI for now. 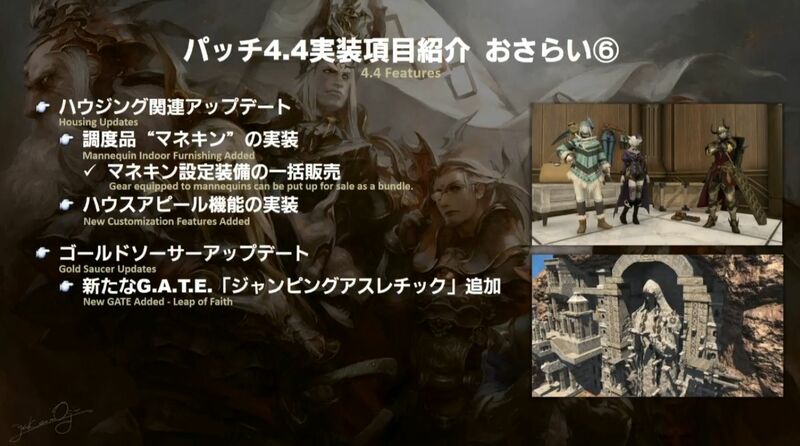 Will be updated later. 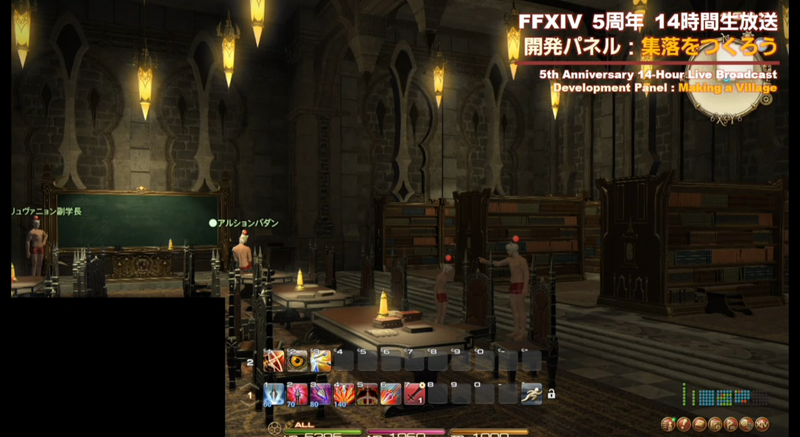 You can set the mannequin’s class/job, race, gender, pose. 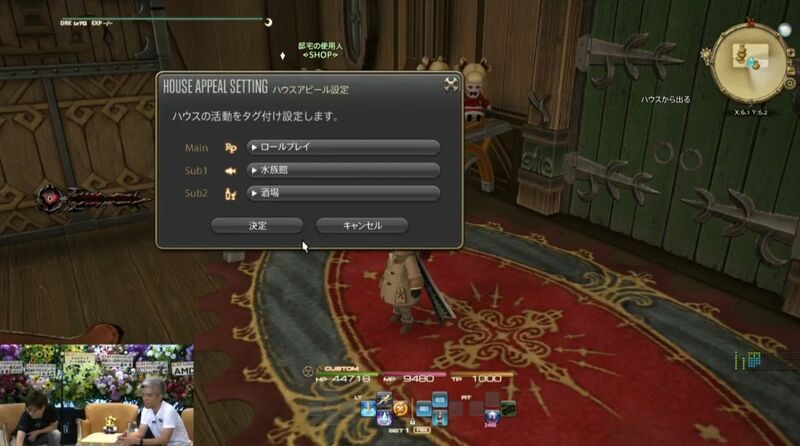 “Housing Appeal” – You can set up to 3 tags for your house. 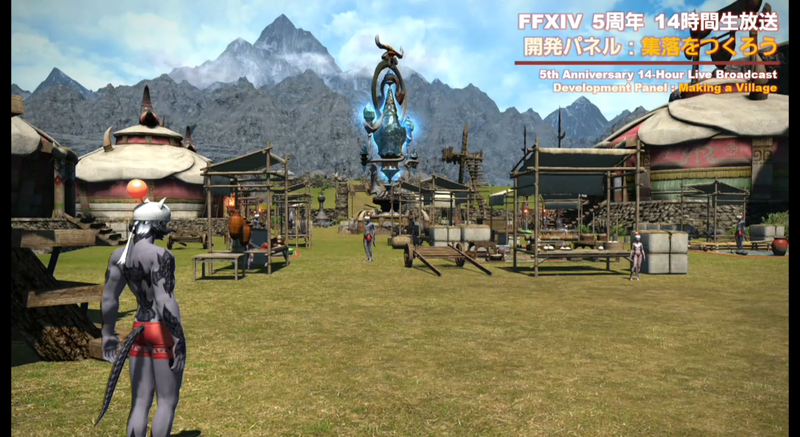 Things like roleplay, aquarium, restaurant, event, escape game, stage, museum, tavern, shop, elaborate interior, etc. 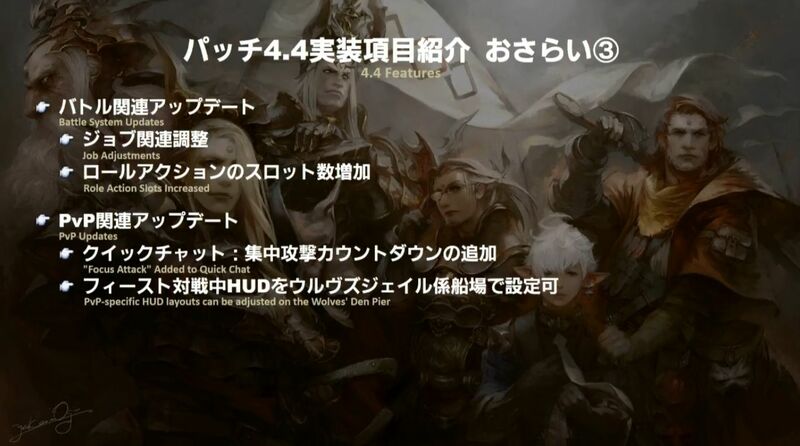 The tags will show up on the ward list and house profile. 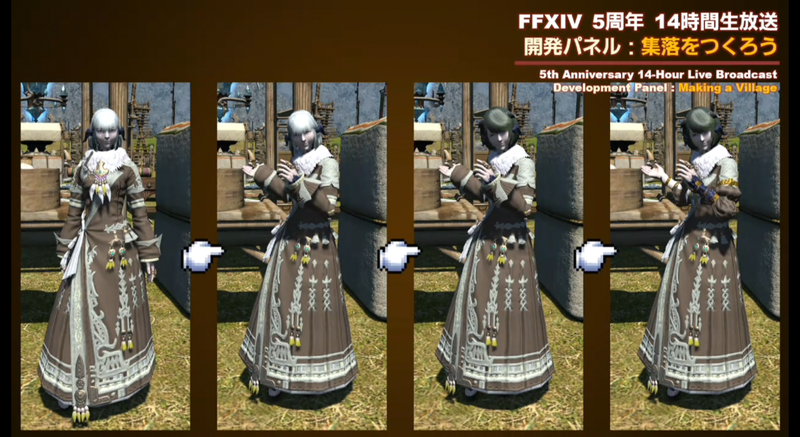 Instanced map with different variations for replay value. 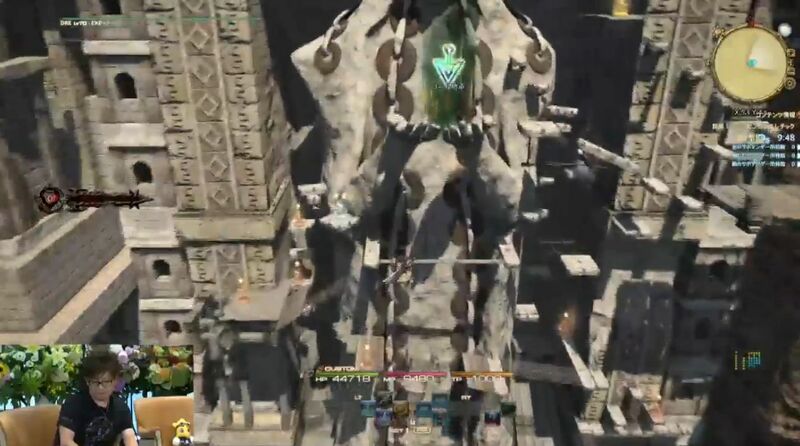 Goal is to reach the green glowing spot; there are also bonus items scattered around that give extra MGP. 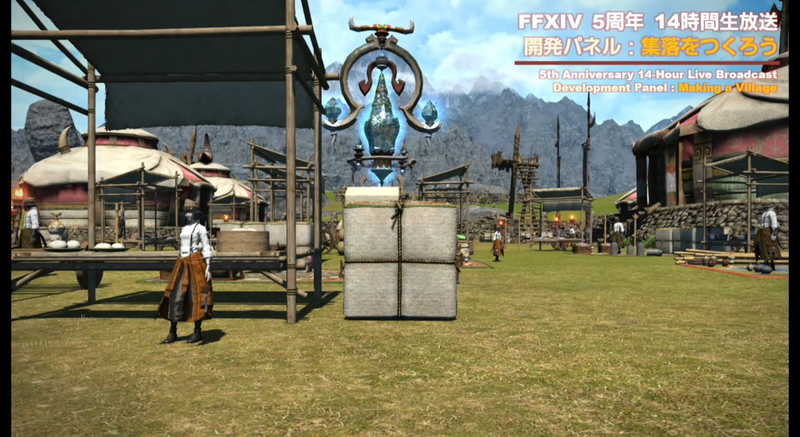 Even if you fail to reach the goal in time, you keep the MGP from the items you picked up. 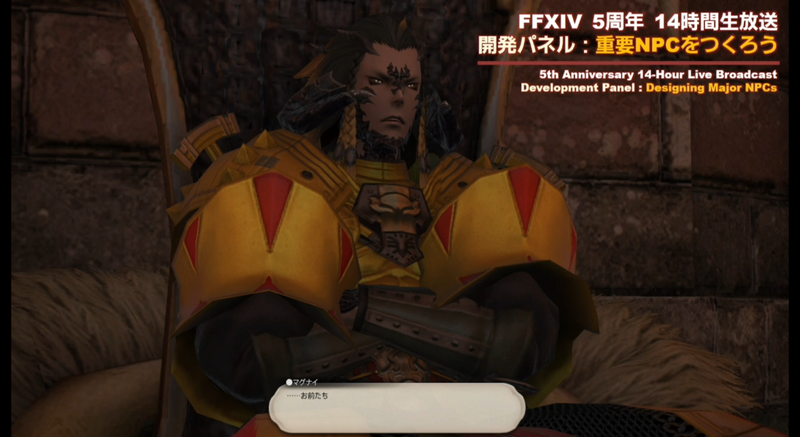 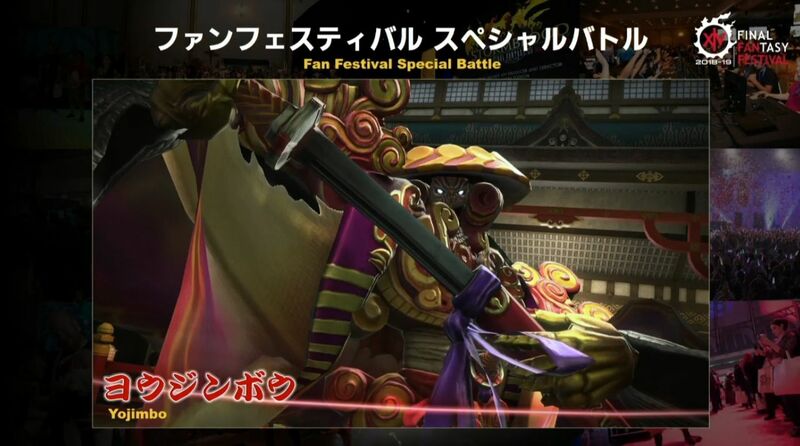 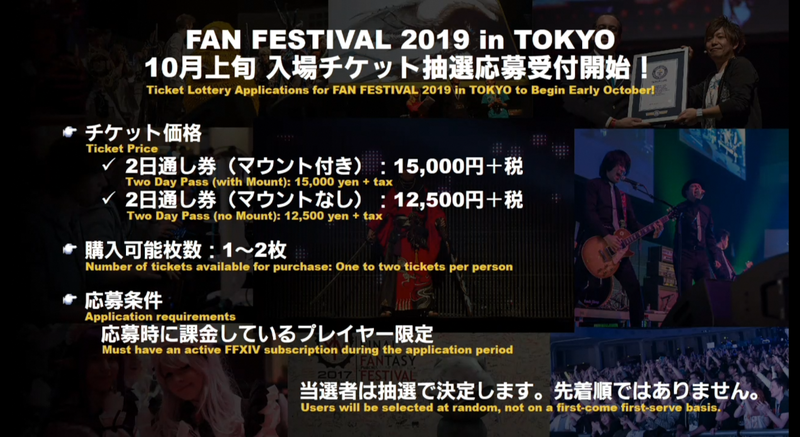 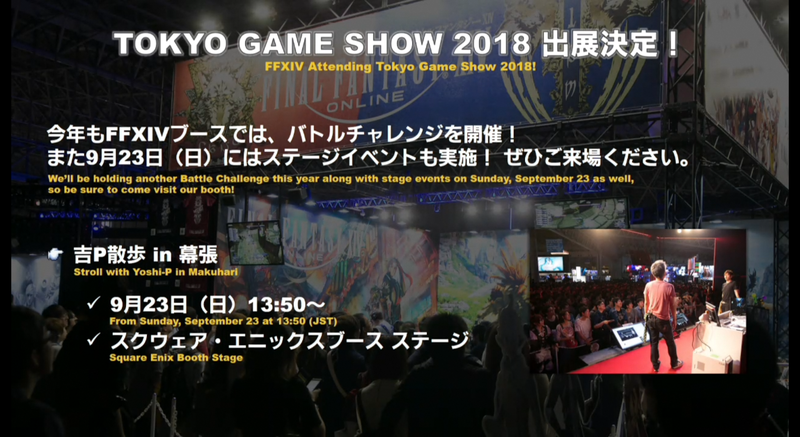 As usual, the fan fest fight (Yojimbo) will be added to the game later on. 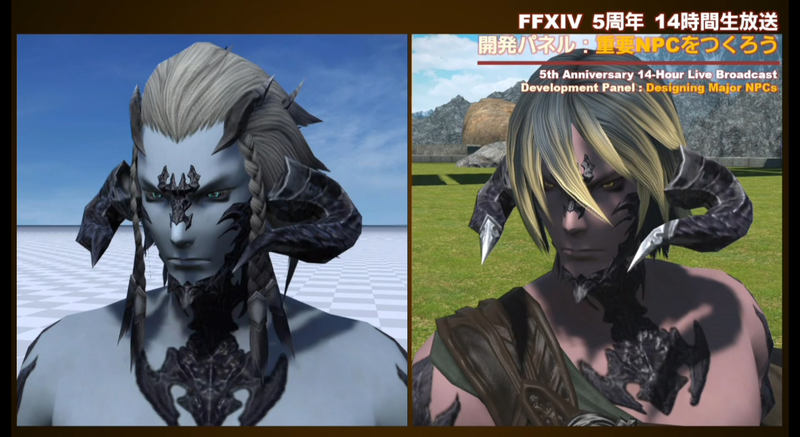 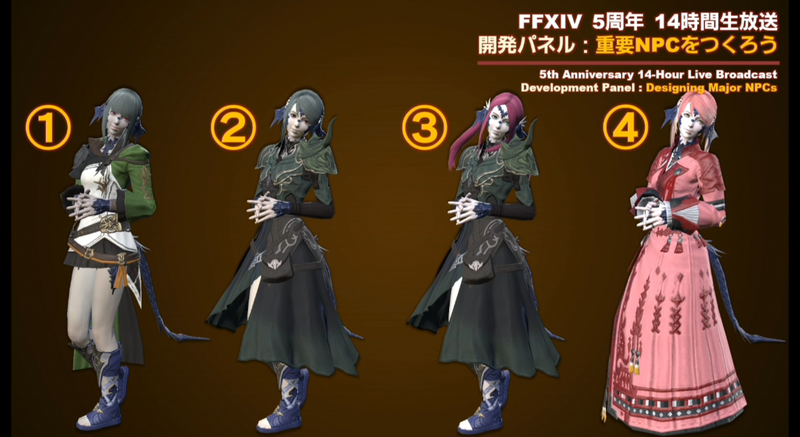 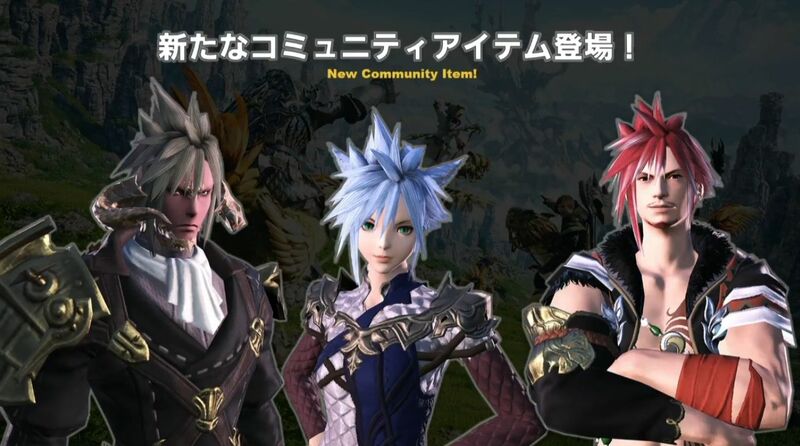 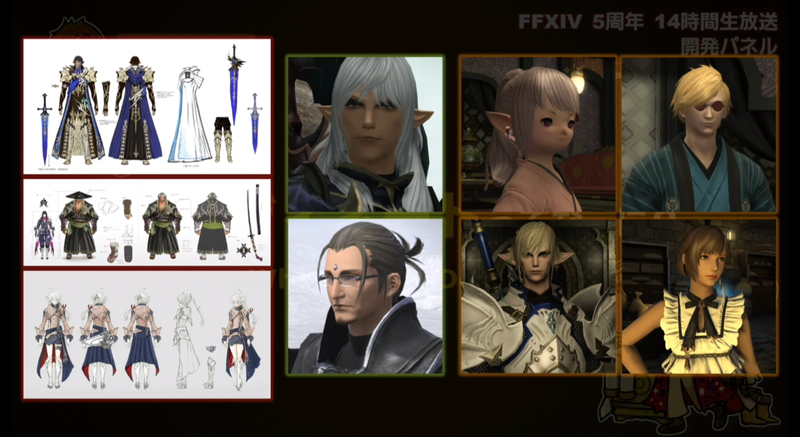 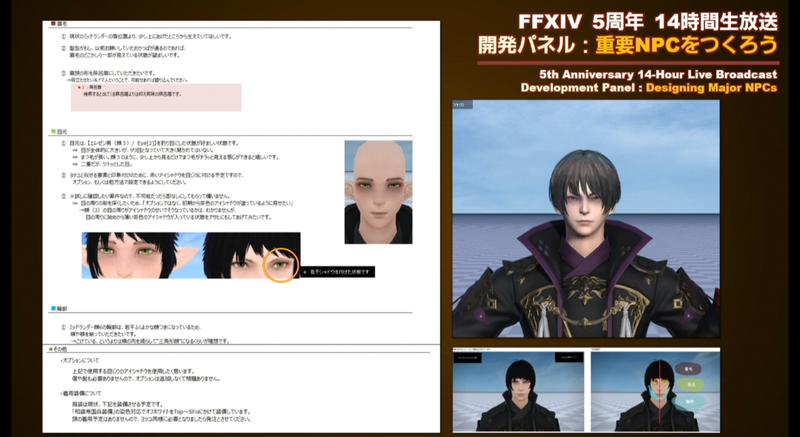 The new hairstyle shown will be a prize from contests such as the fan fest art contest.